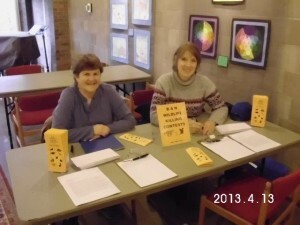 ARAUNY participated again in ‘Petition Weekend’, at First Unitarian Church on Sat/Sun (April 13-14, 2013). Approx 10 groups from various social justice causes each sat at a table, with one Petition pertinent to their cause. Along with petitions, most had a prewritten letter for folks to sign/send to their legislator (fed or state, depending on the issue). I prepared a Petition and a Letter, about *Ban Wildlife Killing Contests in NYS*. Martha Sullivan, Emily Smith and Christie Nesbit did the tablings. ARAUNY got the most signatures of all the groups there (yeah). Monday 4/15, Greg mailed all the letters to NYS reps, and our Petition (filled 3 pages) to Assemblymember Deborah Glick. I also created a leaflet (printed on hunter-orange) with as much *general* info as I could find on killing contests, primarily NYS. Remembering how Valerie Will (Buffalo ARA) stressed the importance of wording, most was verbatim from my resources: LOHV, HSUS, Glick’s Bill A3661.